Do you live in an area that has a lot of traffic? Are there a lot of noises at night that seem to keep you awake for hours? If you find yourself having insomnia frequently, then one solution to this issue is to purchase a white noise machine to block out the noise that is disturbing you. You can set it to sound like a forest instead of the city that is outside of your window. You can listen to the trickle of a gentle stream in a peaceful meadow to soothe you to sleep. A white noise machine is a great way to make intrusive sounds less noticeable; in fact, they can even be used to lull a baby to sleep. It sounds like a great idea, but you are unsure of what features a white noise machine should have, right? Well, we have come up with a guide to help you figure it out. As always, a gold pick means that the product is critically acclaimed and loved by consumers. 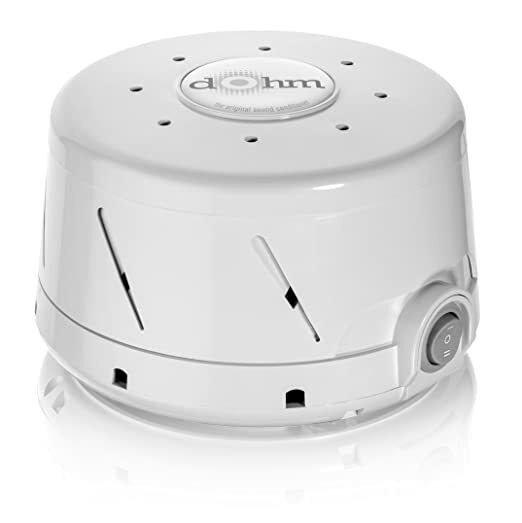 The Marpac DOHM-DS is a white noise machine that fits the bill; in fact, it has been named the official sound conditioner of the National Sleep Foundation. The company has been around for more than 50 years, so you can expect nothing but high quality from their products. It is a machine that is designed to utilize an asymmetrical fan to recreate the soothing sound of rushing air. The motor has two speeds, which means that you can increase and decrease the frequency of the white noise being heard. The twistable cap on the device allows you to customize the constant sound to the volume level you desire as well as the specific tone that helps you sleep the best. The specific white noise that is created by this machine is designed to provide you with a deeper sleep and amore relaxation than many other white noise machines. The whooshing sound created by this machine is the perfect way to mask the sounds of unwanted noises. This includes the sounds of a television set in another room, the sounds of cars honking their horns in the streets, and anything else that may be keeping you awake. It is also a great machine to create a soothing background sound to lull you to sleep, and the best part is that the sound never loops back and repeats itself. The DOHM-DS runs using a 120 volt power source, which is a standard outlet in North America. It is not capable of running on battery power, but the power cord is a full eight feet long, which allows you plenty of length to reach an outlet from most locations in a room. This white noise machine is a lightweight device that is great for traveling. It is only 3 .25 inches high and 5.75 inches in diameter at the base. In addition, it weighs a mere 1.5 pounds, so you will never notice the extra weight in your suitcase. White noise is the only output option with this device, so do not expect to hear natural sounds like a gentle rain shower. It is available for purchase in a beautiful shade of fog white, which will look great in any bedroom. There is also a one year warranty included with the purchase of this white noise machine. 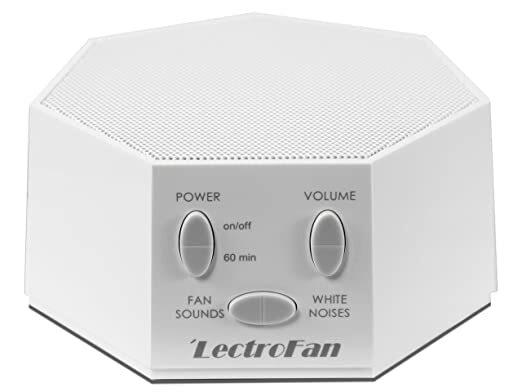 Our silver pick, which is LectroFan’s fan and white noise machine, is a great device to use for anyone that has trouble sleeping. It is complete with 20 different noise options, which are a great option for masking unwanted noises as well as sound therapy to help you sleep better at night. The device is 4.4 inches in length, 2.2 inches in width, and 4.4 inches in height. It is a small compact design that is easy to carry and extremely portable for vacations. In fact, it only weighs about 1.2 pounds, which will hardly be noticeable in any bag you pack it in. There are a plethora of options on this device that range from different white noise frequencies to different sounding fan simulations. The white noise ranges from a low pitch created at 20 Hz to a much higher rang that is created at 20,000 Hz. There are a total of ten different settings for natural white noise, so you will be able to find a range that fits your sleeping needs easily. There are also ten different fan options that you can choose from. They are designed to create the sounds of a large fan, an industrial fan, a mellow fan that is set on a low setting, a mellow fan that is set on a high setting, an exhaust fan, an attic fan, a circular fan, a vent fan, a box fan, and a oscillating fan. Each of these fans varies in sound, tone, and levels of intensity. If you would rather fall asleep to the sounds of a fan, there are plenty of options for you to test out. This device does not feature other sounds that incorporate things like a babbling brook or chirping birds, but there are a great deal of options that you can utilize. In addition, there is also a timer that can be used with this device. You can either turn the white noise machine on to allow it to run continuously until you switch it off, or you can use the 60 minute timer, which is a great option for short naps during the day. To power this device, you will need to plug it into a standard outlet, or if you prefer, you can also use a UBS port as a power option. Batteries cannot be used to power the device. In addition, there is no place to connect external speakers or headphones, but the volume level of the device can be adjusted to levels that are perfectly acceptable without it. This LectroFan device can be purchased in black or white, and it comes complete with a one year warranty. 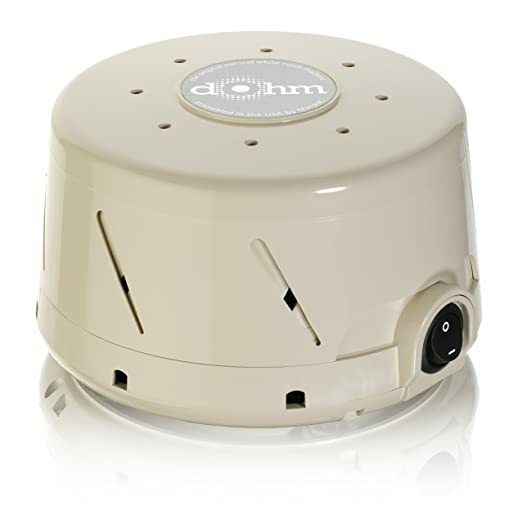 The Dohm-SS, which was chosen as our bronze pick, is a great single speed white noise machine. It is the fourth generation model of this device, and it has become a great way to mask noise that you do not want to hear while you are sleeping. It creates a natural sounding wind pattern that has no loops or repeated sounds. In addition, nothing that you hear will be prerecorded, which is a great way to end nights of restless sleep. The white noise is created by using rushing air through the vents of the machine to create a whooshing sound. The Dohm-SS is an extremely light weight, portable device that can easily be taken with you on your travels. It is only about 3.25 inches tall and 5.75 inches in diameter. In addition, it is easy to place in a bag and forget about it, since it only weighs 1.6 pounds. There are no lights on this device at all, so your sleep can never be disturbed. You can adjust the volume of the white noise the device is creating as well as the tone in which it is being played. This white noise machine does not feature a timer, so once it is on; it is on for the entire night. Power-wise, you will need a 120 volt power source to plug in the AC adaptor, which is the amount of power you get with the outlets found in North America. There is no option to use batteries with this device, so if you plan to travel to another country, you may have difficulties obtaining enough power to keep it running. The plug is eight feet long, so if your outlet is located on the far side of the room, you will most likely still be able to place it on your bed stand. Imagine this vicious cycle, you have trouble sleeping at night, but you feel that you cannot spend a fortune on a white noise machine. You postpone buying one and the poor sleeping habits continue. You are worse off at work because you are lacking sleep, and this could have all been solved if you actually bought that white noise machine you were looking to purchase. Our ballin’ on a budget pick is the perfect solution to your problems, it is able to drown out unwanted noises and provide you with a restful night of sleep, all without breaking the bank. 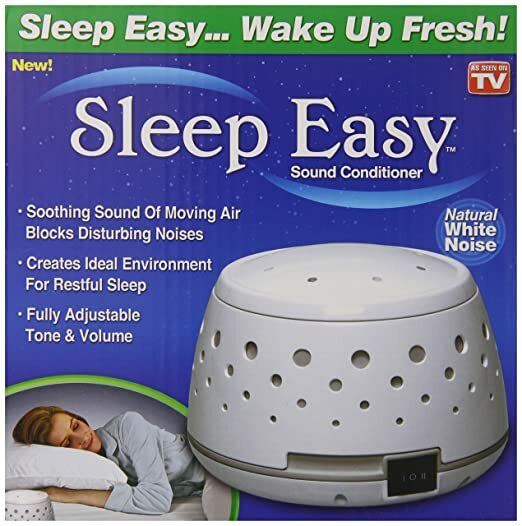 The Sleep Easy Sound Conditioner is designed to create natural sounding white noise that mimics a fan without blowing cold breeze over you. It is 6.3 inches on all sides and it is 6.4 inches tall. It is only four pounds, but it is not quite as light as some of the other options on our list. The volume and the tone of the device can be adjusted, but there is only an option for white noise, no natural sound options. In addition, there is no timer or battery power option. The device is white in color, and it can be purchased in packs of one, two, or four, which allows you to place multiple machines in one room. Doing this will increase the volume of the white noise you are experiencing, which can be a great advantage if you are trying to drown out the noise of a city street. Are you trying to cover up sounds that are keeping you awake at night or do you simply sleep better with some soft sounds in your room? If you are masking other noise, then a mechanical white noise machine may be a good option for you. It is simply a loud fan that can be heard over other disturbing sounds. It is designed to sound more pleasant to your ear as you fall asleep. An electronic white noise machine is a little different than the mechanical version. Of course, it uses power to create a soothing sound for you, but it also will have many other sound options available. Any white noise machine worth its salt will allow you to choice from a library of sound options. Most have sounds that incorporate water, like a gentle rain fall, a babbling brook, a waterfall, or even the sounds of waves crashing on the beach. Others combine water and other sounds to give you options like thunderstorms and the sounds of a forest with a stream nearby. You can also find wind sounds to lull you to sleep as well as animal sounds that you may hear in the forest at night, such as owls, frogs, and crickets. Another common option is city sounds, which would include things like trains rushing by, car horns, and other ambient sounds heard in a city environment. Some white noise machines even allow you to listen to soothing classical music as you fall asleep or the sound of a heartbeat. If you are using the machine for a small child, some devices allow you to play lullabies and nursery rhymes that will feel familiar and safe. Some older white noise machines may not have the ability to control the volume, but this means that you may not be able to cover the noise that you are trying to mask. Low volumes could be extremely inefficient and high volumes may disturb others in your home. Having a volume knob allows you to find the perfect level. Another concern that you may wish to consider is how the sound cycles. Each white sound machine is different; some cycle through four to ten different options that give you a variety of listening noise, while others tend to keep the selection to a minimal number, which causes the sound to loop and repeat itself more often. When purchasing a device that you will use daily, it is important to get a quality machine that will not let you down. Some cheap white noise machines do not have many sound options, so they tend to loop, which can be an annoyance to some. Also, make sure that the white noise machine that you purchase comes with a warranty of some kind. It is better to spend a bit more to get the warranty you want rather than purchase a device that is not covered at all. Many white noise machines have timers incorporated into the device. These timers are designed to turn the white noise off after a certain period of time has passed. Some white noise machines suddenly turn of the noise all at once, while others do it a bit more gradually. If you are a light sleeper who depends on white noise to sleep, the sudden change in what you are hearing can actually wake you up. Make sure that you find a setting that will allow you to stay asleep throughout the night. In addition, there are also white noise machines that have an alarm function that will use the gentle white noise to wake you up from your slumber in the place of an alarm clock. This is great for those who may be startled by the abrupt sound of a traditional alarm clock. Some of the other features that you may want to consider in a white noise machine are mere conveniences that could be beneficial. First, if you plan to travel a lot and you need to listen to some type of white noise to fall asleep, then it may be a good idea to invest in a portable option. In addition, you may want to consider a machine that utilizes batteries instead of an AC adapter. If you are thinking of purchasing a white noise machine for a small child, make sure to consider what will be best for them. Some devices can easily be hung from the wall and turned on like a night light. Others are designed specifically for kids, which means that the white noise machine is inside of a stuffed animal that they will easily be able to have by their bed at night. Now that you know exactly what you need to improve your sleeping habits, it is just a matter of making a decision. Perhaps you are even making this purchase to benefit another family member who is having issues sleeping. Maybe you want to mask the noise around you or perhaps you simply sleep better when there is sound in the background. Forging a decision may not be easy, but you can always reference this guide to assist you along the way. Whether you decide to purchase one of the white noise machines on our list or your research leads you to a different option, hopefully your purchase will give you countless restful nights in the future.